So, you got them flowers for their birthday and you want to tell them with a card how much they mean to you. Now it’s just a matter of deciding what to put in this marvelous card. Birthday cards can be confusing when there are so many that all say basically the same thing. They’re all so generic and the worst thing possible would be seeing them get the same card before they get yours and thinking that you copied someone else’s gift. With this list you are sure to see some unique, eye-catching, personal cards that are sure to brighten their day and stand out to you and them as the perfect message to give them and tell them you care with some beautiful flowers. Whether you’re the person who wants to give them the most personalized, awesome, wonderful, heartfelt birthday card in the world or the person who wants to crack an appropriate but still terribly funny joke and make everyone smile we have the perfect card message for you and your loved one or friend. Give a very unique, heart-warming card that tells them how much you care. These messages have been personalized to meet the needs of someone who is giving the cheap, but meaningful gift of flowers and cards who wishes to show that these wonderful gifts come from the heart. It’s the thought that counts and in this case it will count for a lot. Hip-hip-hooray! It’s your birthday. 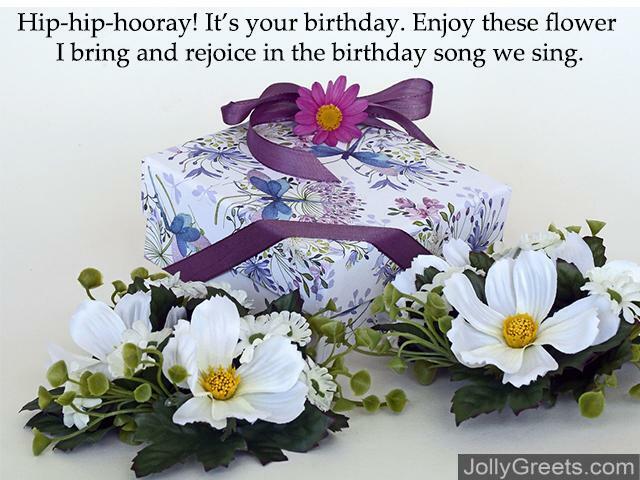 Enjoy these flower I bring and rejoice in the birthday song we sing. Roses are red, violets are blue, we’re all so blessed, another year we’ve known you. (For spouse) All these years you’ve stuck with me, all the love that you bring. I love you, I know you love me. 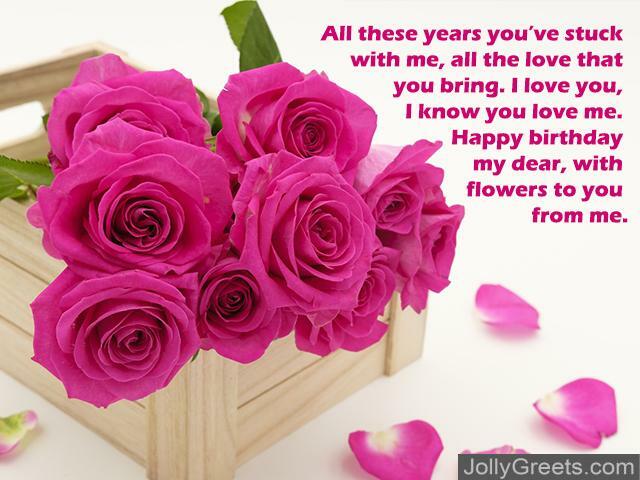 Happy birthday my dear, with flowers to you from me. (For co-worker) Happy birthday. I love having you work next to me every day and I hope I get that privilege for years to come. Please accept these flowers, because you’ve earned them. (For parent) Another year goes by, as I watch you stand strong. You dedicated so many years to raising me. 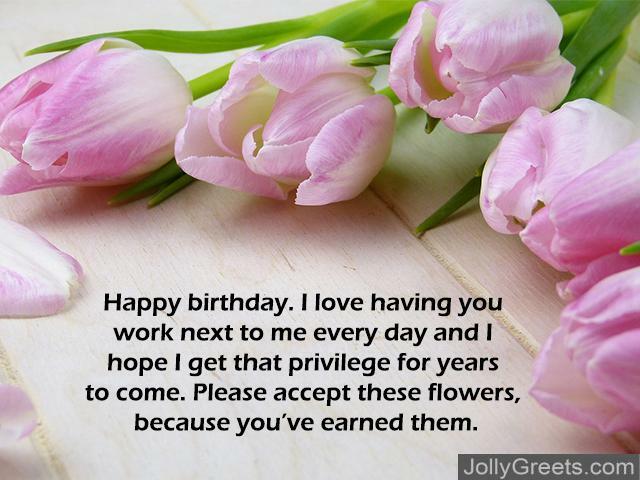 The least I can do is send flowers and dedicate one day every year to you. Thank you so much and happy birthday. This is the day we give thanks for you, Flowers bring smiles as we start anew. A whole new year, the very same you. Happy birthday and we all love you. (For child) I loved you before you were born. I loved you while you grew. I loved you as I watched you flourish and through everything you do. I love you even now, as you grow once again. It makes me feel quite old, but I love it in the end. Here are some flowers, for my baby all grown up. Just remember I love you, I’m proud, and you’ll always be enough. (For child) You were once inside me. I protected you through the years. As I watched you grow and leave the nest, I discover you’re still here. I bring you flowers not because I couldn’t get you anything else. I bring you flowers because as I watched you grow, so I’ve done with these. I watered and fed and tended them and cut them from their leaves. These are for you, my baby. Happy birthday. Funny: Make a joke to brighten their day as you wish them happy birthday. You can’t forget that sometimes it’s great to laugh on the day that’s all about them. These messages should bring laughter to you, them, and everyone around when you present them with your wonderful gift of beautiful flowers and a witty, hilarious card. Another year, another bunch of flowers. Happy birthday. Maybe next time you’ll tell me what you want so I don’t get you flowers again. Flowers, flowers, smell so sweet and oh so pretty. I was hoping I’d come up with a joke that sounded kind of witty. I want to make you laugh, on your very special day. I guess all I have left is to wish you happy birthday. How old are you? That’s what we all want to know. Because I’d like to be able to get you one of those cards that says happy 3rd, 22nd, or even 97th birthday. But I don’t know how old you are, nobody does, so I was forced to write it down in a card and ask you. So? How old? Oh, I know. I’ll just write, “Happy (fill in the blank) birthday.” Perfect solution. (For spouse) Here’s some flowers, because we’ve been together so long I’ve gotten you every birthday gift under the sun. In all seriousness, I love you. Happy birthday. (For spouse) Happy birthday, happy birthday, happy birthday to you. Got you your favorite flowers. Now, back to the television. (For co-worker) Happy birthday. Now, play any more office pranks on me and this will be your last year in this office. Take these flowers as a sign of good will. (For child) I made you. I should be getting flowers and parties and gifts. How do you get a day all about you just for getting made by me? There should be a day for conception, 9 months of waiting, money spending, and labor, not for birth. Happy birthday, since that’s our society’s decision.